The most advanced hands-free listening, calling, and gaming experience in one ultimate bundle. Do you need more freedom to safely talk or voice text while driving? Need clear communication while on a job site? Would you love to connect your computer to your new Alexa device from Amazon? Thanks to the Oxi Bluetooth Headset and USB Dongle Bundle , you can do all that and more. Finally enjoy the power of total hands-free freedom by connecting all your favorite devices with advanced 4.0 Bluetooth technology. And thanks to superfast connectivity, noise cancelling headphones, and a built-in microphone, you can game, drive, play, Skype, and work without ever having to use your hands! Oxi Headset Product Details: Bluetooth 4.0 Technology Connects to Multiple Devices Simultaneously Noise-Cancelling Headphones with Built-In Microphone Adjustable, Comfort Fit Ear Cushions One-Touch Call, Answer, Volume and Redial Rechargeable Battery with LED Indicator Talk Time: 18-21 Hours Standby Time Up to 250 Hours USB Dongle Product Features: Bluetooth 4.0 Technology with 3 Mbps Connection Supports Networking, Dial-Up, Fax, and LAN Access Backwards Compatibility: Windows 2000, XP, Vista, 7, 8 Connect with Oxi Bluetooth Headset, Keyboards, Mice, Speakers and More Plug and Play Installation 2.4 GHz Orders Include: OX-B250 Bluetooth Headset USB Cable, USB Car Charger, AC Wall Charger USB Dongle Instructional User Manual One Year Warranty Oxi products are backed by a complete one-year warranty. 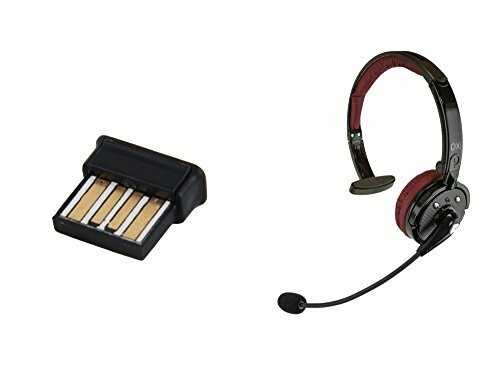 Enjoy a completely hands-free lifestyle with this versatile Bluetooth headset and USB dongle bundle. Get yours now by clicking Add to Cart above. NOISE-CANCELLING CLARITY - Oxi headphones feature built-in microphones for enhanced voice communication and and comfortable, padded cups to block out sounds while driving, playing video games on your TV or even loud children. ADVANCED BLUETOOTH TECHNOLOGY - Both the Oxi Wireless Bluetooth Earphones and the USB Dongle are designed with lightning-fast 4.0 Bluetooth speeds, giving a stronger, more reliable connection with instant connectivity. If you have any questions about this product by Oxi, contact us by completing and submitting the form below. If you are looking for a specif part number, please include it with your message.